In 4000 B.C., just as humans were beginning to use pictographs, hunter gatherers were living in and around Almere. It would be another 1000 years before written history began. So in 4000 B.C. no one was able to record exactly when that the area around Almere flooded. Or exactly when the hunter gatherers were driven out. How long they had lived there prior to being driven south and east by the raising water, nobody knows. Around 44 A.D. the Roman map maker Pomponius Mela refers to the area as Flevo Lacus, Lacus being the Latin word for lake. Flevum refers to area east of the Fortress of Frisii, which lies at the mouth of the river Ems. The Frisii, or Frisians, were tribes that lives along the northern coasts of Netherlands and Germany. Thus Flevo Lacus was the sea east of Frisia, which today is known as Friesland. If this area was Flevo Lacus it means what is now Flevoland was still under water. The Romans leave Flevoland in the mid 4th century A.D., due to, what else, flooding. In fact the next 1500 years or so were a vicious cycle of settling, flooding, and running away. In 1686 the St Martin floods ravage northern Netherlands resulting in the death of over 1500 people who drown. 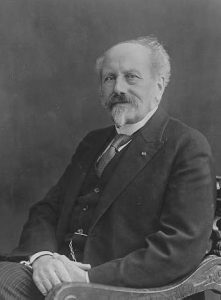 The sad story finally sees its first glimmer of light in 1890 when a Dutch engineer named Cornelis Lely hatches a wild plan. He wants to close off the South Sea, or Zuider Zee in Dutch, and drain it. This would create an entirely new part of the Netherlands. Naturally this was met with all sorts of derision and mockery. 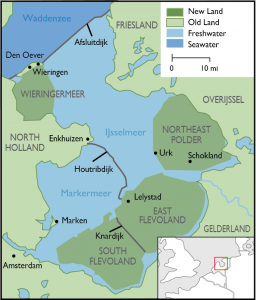 The idea of removing the sea after 6000 years of the sea kicking the snot out of the Flevoland area seemed fanciful at best. It seemed disastrous at worst, never mind impractical and costly. But Lely didn’t give up and a massive food shortage during WWI made the idea of having more farmland seem like a better idea that could offset its gigantic risks and costs. In 1932, the first dike Afsluitdijk was constructed which created the current IJsselmeer Lake and Flevoland was drained. When WWII broke out the Germans weren’t very interested in northern Netherlands, and they certainly weren’t interested in the still flooded northern area so they basically left it alone. Between 1939- 1942 the northern polder, the dutch word for land reclaimed from the sea, is drained and many Jewish people end up hiding in the area. With the German disinterest in the area, it was the perfect place to hide until the war ended. 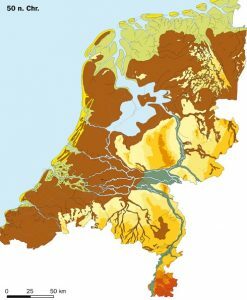 In the 1950’s, the southeastern and southwestern areas were also drained and most of what is now Flevoland existed in geological form. What did not exist were any cities or people really. So in 1971, noting the overcrowding in much of northern Holland, the government decided to create a new city in Flevoland. In 1975 the first dwelling is built for the construction workers in what is now Almere Haven and Almere is born. By 1980 there are 10,000 inhabitants in Almere. Construction begins on Almere Stad, what is now the commercial and city center. By 1986, Almere has a population of 50,000 and consists of three districts; Almere Haven, Almere Stad, and Almere Buiten. In 1994, realizing there was no real city center for the 100,000 residents, bids were taken for the construction of what is now the City Mall area. This was completed in 2005. In 2014, Almere had a population of over 250,000. What had been the bottom of the sea for 6000 years had now become a city of a quarter of a million people in just 40 years. In 2022 Almere will host the Growing Green Cities Expo. Projections have the population exceeding 300,000 by that time. Houses are being built in new areas such as Almere Poort and each district is expanding a bit. Whenever the population demands it, new districts can be built, constructed and hooked into the modern system of Almere transportation, utilities and services.